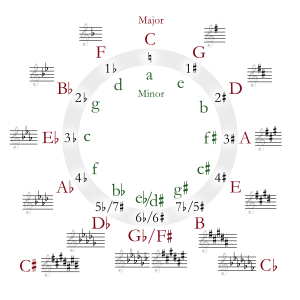 G-sharp minor is a minor scale based on G♯. For the harmonic minor, the F♯ is raised to F .
Its key signature has five sharps. Its relative major is B major. The melodic and harmonic versions of the scale are written in with accidentals as necessary. G-sharp minor is usually not used in orchestral music except to modulate, but it is more common in keyboard music, like Scriabin's sonatas. For orchestration of piano music (writing it so an orchestra can play it), sometimes the music is transposed to G minor or A minor. If G-sharp minor must be used, B-flat wind instruments should have their part written in B-flat minor, not A-sharp minor. In a few scores, 5-sharp key signatures in the bass clef are written with the sharp for the A on the top line. A. Morris, "Symphonies, Numbers and Keys" in Bob's Poetry Magazine, III.3, 2006. This page was last changed on 17 April 2013, at 11:35.